Is Michelangelo's Sistine Ceiling at The Vatican Under Threat? The Sistine Chapel recently celebrated its 500th Birthday and, along with a huge party, it also got a warning — it may soon have only a limited amount of visitors. More than 20,000 people a day — that's 5 million a year — visit the chapel, making it THE MOST visited room in the world! That's a lot of people packed into a space that is only 130 feet long and around 143 feet wide (approx. the same measurements that are recorded in the Bible for The Temple of Solomon). Though many of these visitors are respectful cultural-tourists, more and more they are herds of people who are there only to say that they were, know little about the value of what they are looking at, and have no qualms about using flashes to take photos (camera flashes damage the pigments in the paintings) or even touch the work (NOT GOOD). Interestingly, if he were still alive, Michelangelo himself may not have cared if the work was damaged. In 1508, he was ordered by Pope Julius to redecorate the ceiling which pulled him away from what he loved most — sculpture. In a letter to one of his friends, he called the work "a miserable job" and wrote, "I'm not a painter". Not someone to do anything halfway, he mastered the fresco technique and, despite hating every minute of it, created one of the most iconic works of all time. So, with human breath damaging this stunning chapel that is important to the pious, the artists, the historians, and mass tourism alike, what is the solution? Apparently, the Vatican is searching for a high-end air purification system that will keep the work safe. Until a solution is found, constant restoration is the only other option other than limiting numbers or closing the doors of the chapel altogether. Subscribe to The Anthrotorian's Newsletter for more of the latest art news! Imagine that you are one of the first explorers to North America’s West Coast. It’s early morning, and after a paddle through the still ocean water, you have docked your canoe on a grey pebble beach. The sun has yet to pierce through the thick fog, and you can see your breath in the crisp air. There is not a soul in sight. The forest in front of you is lush, thick and dark. Taking a deep calming breath, you step into the green, snapping twigs underfoot and moving damp leaves out of your path. Bushing away an especially heavy heavy branch your jaw drops as you find yourself suddenly in a clearing with a massive, wooden sculpture that seems to stretch up almost higher than the trees, standing in the middle of it. You had heard rumors that these monumental structures existed, and now there it was, right in front of you — a totem pole. Carved mostly from Western Red Cedar trees, totem poles are created by the Indigenous peoples of the Pacific Northwest Coast of North America. Because cedar decomposes quickly, few examples of these massive structures from before 1900 exist today. These free-standing poles were symbols of individual clans, family wealth, and prestige. Scholars believe the Haida of the Queen Charlotte Islands were the first to create the totems, and then the practice spread throughout the West Coast. 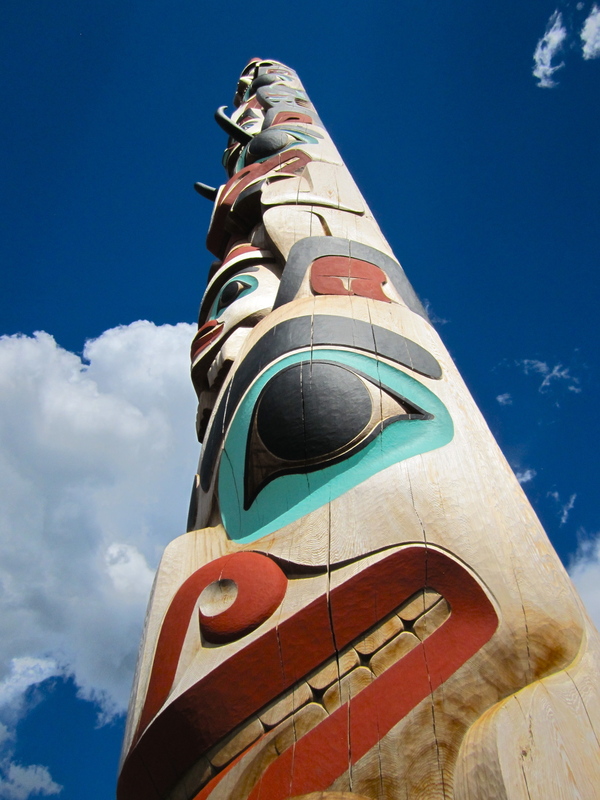 The meaning behind the totem poles is as varied as the cultures that make them. Some represent familiar legends, clan images, notable lives of tribe members, mortuary statues, or mark an important celebration. Contrary to popular belief, they were NEVER objects of worship. It is widely believed that the least important carving is on the bottom of the pole (hence the saying “lowest man on the totem pole”), but, in reality, the most important figures can often be found on the bottom or even in the middle of the poles! Learn more fascinating things about human history! Subscribe to The Anthrotorian's Newsletter! A watercolour painting? Packing tape on the wall? A painted square of colour? A bicycle wheel drilled to a stool? A marble sculpture? Are all of these things really considered art? So, art is anything that someone thinks is beautiful, appealing OR significant. So, according to this definition, art is basically dependent on, well, anything. Some think that art is only art if it is worth money, others believe it only matters if it is hung in a gallery, and even others consider the most priceless pieces of art to be those created by the hands of a child. The easiest answer: whatever you want it to be! Whether it is a Monet, or your daughter’s finger painting, if it makes you happy and makes you feel something than it is art to you! Need more art in your life? Subscribe to The Anthrotorian's Newsletter! TAGS: definitions, art, artists, what is art, question, definition, define, art is amazing, what is important art, why is art so expensive, how do you define art? Alex Janvier may be a prolific and significant Canadian Aboriginal Artist, but there are no teepees, totem poles, or feathered headdresses in his portfolio. His impressive 50-year artistic career and his contribution to the art world caused him to receive the Governor General Award in 2008, but there was once a time when the Canadian government was ready to hinder, rather than help, the progression of his career. After some research, attending a few lectures, and speaking directly to the artist himself, here is what I’ve discovered. Janvier’s father was the last of the hereditary Chiefs in the Dene line (an Aboriginal Band that resided in the Northern boreal and Arctic regions of Canada). When he was a child, missionaries and colonizers trying to integrate the Aboriginal people into their society, broke this line by sending him to the Blue Quills Reservation School. At this school, away from his community, he was taught that the ways of his people were evil, and he suffered indescribable physical abuse at the hands of priests and teachers. At the age of 17 (in the 1950s), he left the reservation and began studying at the University of Alberta Faculty of Extension before registering in the Fine Arts program at SAIT (Southern Alberta Institute of Technology). At the time, he was the ONLY Aboriginal student in the school. When the Indian Affairs department of the government caught wind that they were paying for him to receive a fine arts education, they threatened to pull funding unless he switched to a trade more suited for "Indians". Luckily, his instructors stood up for him and managed to convince the department to let him remain in the fine arts program, but only with reduced funding(!). When he completed his studies, the department took some of his work from him as payment for his education. Pieces that are speculated to be those taken as "payment" have recently surfaced and are pictured above. Another issue that the Department of Indian Affairs had with his work was that it wasn’t "Indian" enough. They expected to see totem poles, paintings of Chiefs, and dream-catchers that could be used to advertise the "Indian" culture to the outside world. Janvier’s work instead draws influences from surrealism and automatism, looking abstract and almost dreamlike. Though there are Aboriginal influences in his work, they are influences that will only be recognized by people who actually know anything about his culture. For example, the Dene people use lines and dots made from rocks and sticks to communicate when on hunting trails, both of these symbols can be found in Janvier’s works. As well, the idea of automatic drawing links back to the hunter’s dream which is revered in his culture. He also uses patterns in his pieces drawn from the traditional beadwork and birch-bark artistry of his mother. Coming from this background, it is not surprising that some of Janvier’s work has been somewhat political. For example, on some of his paintings, the number "287" is painted near his signature. This is his treaty number (a number assigned to him as an identifier when he was young) and was his way of protesting how Indian Affairs looked at his people as numbers instead of human beings. When I spoke to the artist — after he had kissed me on the cheek and tried to set me up with his grandsons — he told me that when he first started working, there was a group that included him and other Aboriginal artists that were referred to as the "Indian Group of Seven". To me, this is a label of reverence considering the Group of Seven is a celebrated group of Canadian painters whose work is known all over the world. Alex, however, told me that they were called this “in a mocking way” — basically being told that they could never live up to the real Group of Seven. Other than their cultural background, there was another big difference between the two groups. Janvier and his colleagues received NO funding for the government. The reason? They were not taxpayers. This funding disparity is something that the artist has continued to lobby for, along with his attempts to break through the line that separates Aboriginal Art from Canadian Art. Right now, the two are considered different things, and Alex hopes, one day, they will be one and the same. Learn more about amazing artists! Subscribe to The Anthrotorian's Newsletter.